The country of Finland continues to impress guitar fans and case in point is a way-cool 2019 album release by Kepa Härkönen called Spicy Tales & Spacey Tones. The 12 track CD features ten originals and a pair of covers by Freddie King and surf-rock legends The Bel-Airs. The album is a fitting display of Kepas guitar influences that run the gamut from Mickey Baker and Freddie King to Ry Cooder, Shadows icon Hank B. Marvin and jazzers like Kenny Burrell and flamenco king Paco De Lucia. 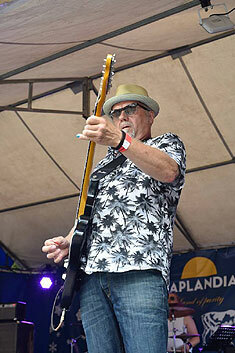 Kepa explains, I see myself as a blues guitarist, but I always loved and played all 1960s guitar instrumentals, too. My style is mix of The Shadows, American surf, blues, and Finnish Rautalanka with Cuban influences. CRACKED LATIN - The World Is Cracked Latin! DOUGHBOYS - Front Street Rebels. BARRY OLLMAN - What'll It Be? THE SMITHEREENS - Meet The Smithereens! RANDY KLEIN - What's Next? RONDO HATTON - Destination... Fun!! JOHN STEIN - Bing Bang Boom! THE SURFADERS - Dragstrip Murder Mystery. ARTTU TAKALO - Dark. Dark. Dark. VARIOUS ARTISTS - Get The Led Out! Ian Anderson - Do You Believe In The Day? Don Wilson - Alive Five-0! Buzzy Linhart - The Time To Live Is Now!